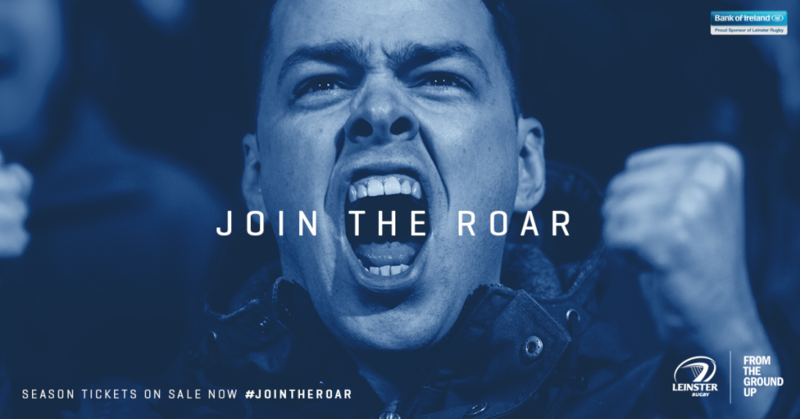 Leinster Rugby | Over 10,000 supporters have joined the roar! Over 10,000 supporters have joined the roar! As the team prepare for next Friday’s Guinness PRO12 Semi-Final at the RDS Arena against Scarlets, Leinster Rugby supporters are already snapping up Season Tickets for 2017/18 with over 10,000 committed to #JoinTheRoar next season. This comes on the back of a season which has seen a combined attendance of 288,944 at Leinster Rugby’s games in the Guinness PRO12 and European Rugby Champions Cup, including the 50,266 supporters that came to roar on Leinster in the Champions Cup Semi-Final against Wasps at Aviva Stadium on April 1. A Season Ticket means your place is guaranteed at Leinster Rugby’s 11 home PRO12 games and three home pool matches in the Champions Cup at the RDS Arena and Aviva Stadium. Join the roar and get your Season Ticket from leinsterseasontickets.ie. Find out more about Season Ticket Benefits, which includes a free Season Tickets holder gift. Season Ticket holders can also make use of our payment plan which allows you to pay for your Season Ticket through a number of monthly instalments. Find out more about Season Ticket payment options.